TSG is manufactured by subjecting final size, edgeworked panes of glass to a high temperature, followed by rapid cooling which causes high compressive stresses in the surface of the glass balanced by tensile stresses in the centre that result in a glass that is up to 5 times stronger. However it can break under extreme loads which bend the glass or by severe impact with a sharp object. When broken, TSG shatters into small, blunt-edged fragments which reduce the risk of personal injury. 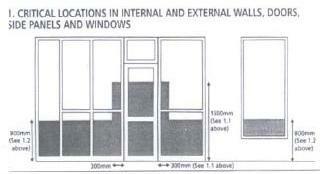 This is why Building Control Regulations ensure the use of TSG in what are deemed as Critical Safety Areas. Laminated glass is manufactured by bonding two or more sheets of glass together under heat with pressure. Incorporating one or more interlayers of Poly Vinyl Butyral (PVB) or using "cold pour" resins. The most significant feature of laminated glass is that when impacted, it may fracture, but the glass fragments will stay in place, adhering to the plastic interlayer. It therefore minimises the risk of injury from shards of glass and also remains integral, providing protection from the elements and from intruders. The 6.4mm product is the most widely used thickness for protecting people against risk of accidental injury giving a Class B performance to BS 6206: 1981.The relatively soft PVB interlayer also has the effect of dampening sound, giving laminated glass better noise reduction properties than the equivalent thickness of float glass, in particular it greatly reduces sound insulation at the resonant frequency. The PVB interlayer also filters out 99% of ultra-violet light, which is known to be the main cause of fading and discolouration of indoor materials used in carpets, curtains and other furniture. The performance of laminated glass can be varied by changing the number of bonded sheets, the thickness of glass sheet and the number of interlayers. Giving the specifier a wide choice of products dependent upon application, whether it be for safety or security, noise control, solar control, thermal insulation, bullet resistance, blast resistance or privacy and decoration. An extreme application product using panes of toughened glass laminated together to provide very high impact performance and excellent security. Toughened laminated glass is particularly useful in overhead and roofing applications as it is extremely tough and even if fractured the glass remains in place due to the PVB interlayer.